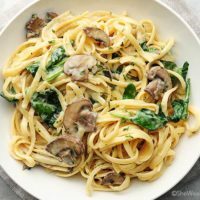 This creamy Mushroom Florentine Pasta Recipe may seem like a fancy dish, but it’s oh so quick and easy to make. The recipe is easy enough for a weeknight meal, but elegant for entertaining or enjoying as a celebration dinner, and it is a terrific meatless option. Pasta and me, we go way back. I could easily eat it everyday. Easily. Although it is something I’ve had to learn to eat in moderation. So when I do enjoy a pasta dish, I really want it to be worth it. And this Mushroom Florentine Pasta Recipe is so worth it. I promise. While this creamy Mushroom Florentine Pasta Recipe may look sophisticated it could not be easier to make. Really! This rich pasta dish is full of flavor and cheesy goodness, and is oh so perfect for a special occasion meal or if you happen to be craving comfort food. It’s a great meatless option too. Plus, this delicious pasta recipe can easily be prepared and ready to enjoy in less than 30 minutes. Which beats having to drive to a restaurant and then having to wait any day in my book. As I mentioned, this is one easy dish to make. Begin by cooking the linguine (or a pasta of your choice). While the pasta is cooking, whisk together flour, chicken broth, milk, salt and pepper. Set aside. Then in a large skillet, heat olive oil over medium-high heat. When oil ripples, add sliced mushrooms, and sauté, followed by minced garlic, and quick 2 minute sauté until garlic just begins to brown. Whisk in the flour, chicken broth, milk, salt and pepper mixture into mushrooms and garlic. Almost done! Bring to a simmer and cook, stirring occasionally for about 3-4 minutes. The sauce will thicken. Next goes in the cheese! Stir until the cheese has melted, then stir in the spinach and allow to wilt. Finally, add the drained pasta to the skillet and toss to coat. It really is quick to make. 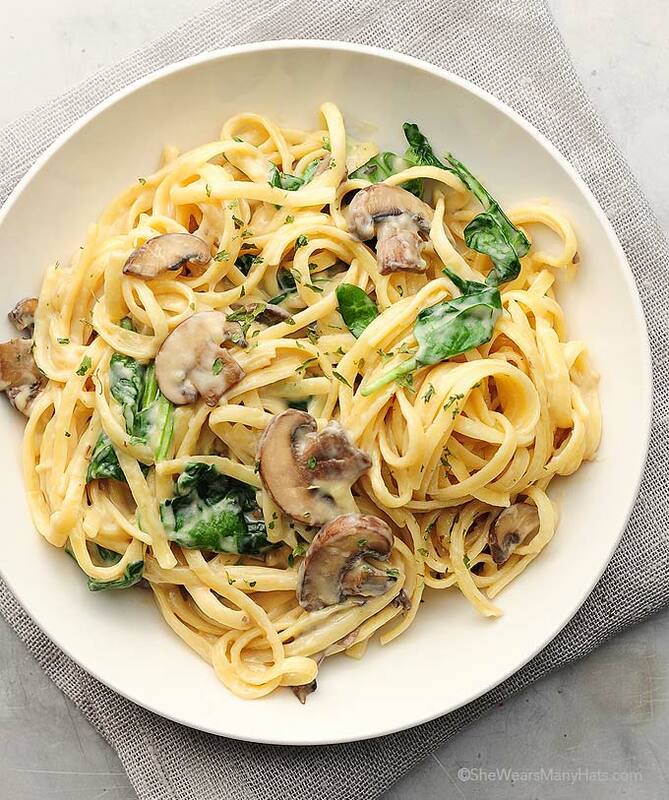 Once you see for yourself how quick and easy this Mushroom Florentine Pasta Recipe is you’ll be adding this tasty meal to your regular routine. It’s a keeper for sure! 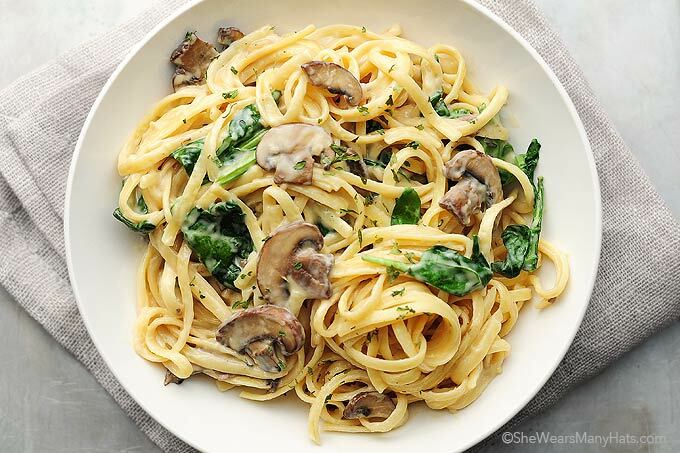 A classic and easy creamy pasta dish made with mushroom, garlic, cheese and spinach. Originally published September 4, 2014. Creamy mushrooms are the best! Love this! Just made it. My husband and I give it two thumbs up. Added chicken to the recipe. Easy and delish! Glad to hear that you both enjoyed it, Patricia! How much sodium and carbs are in a serving of this recipe. I am a heart patient and trying to figure out if I can eat any of this. I’m sorry. I do not have nutritional information at this time. I’m hoping to begin using a nutritional calculator in the next few months that will automatically list all amounts. What a great, simple recipe. I love finding dishes that are elegant enough to serve company but don’t take hours to put together. 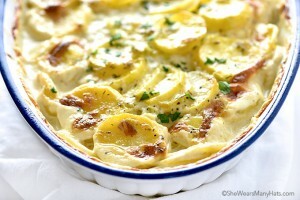 This is also a great summer dish for those days you just can’t turn on the oven. 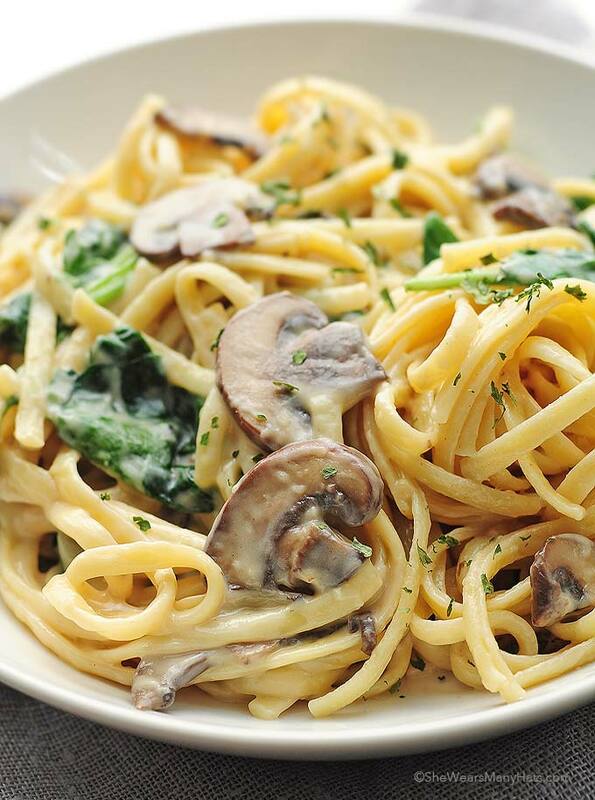 Loving this creamy mushroom pasta! This looks absolutely amazing. I could eat a mushroom pasta dish every day too! And I love how easy it is to make for dinner! I really like a variety and textures/tastes. I used Baby Bellas. Happy Football Sunday! Go Team! 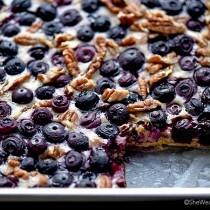 I need to get the store for ingredients and make this ASAP! I made this tonight and used smoked gruyere. Oh, baby! Will any other type of cheese work? Any cheese that will quickly melt should work. Can I use shredded mozzarella? Oh my goodness—Gouda! Let me know how you like it. oh my goodness. . this pasta looks sooooo fabulous. . just pinned it on Pinterest! Making this!! Just made this for tonight’s dinner and it’s delicious!!! Quick and easy dish… Thanks for sharing!!! So happy to hear that you enjoyed it! It’s a personal favorite. How wonderful! Glad you liked it. Would asiago cheese work with this recipe? Yes! I think that would be delicious. This was SO good! I was wondering how you made the cute recipe card? did you use an app? It is a pretty tasty cheese! Glad you enjoyed it. I need to put my fork down for a moment and say….. I discovered this recipe two weeks ago, tonight is the 2nd time I’ve made it. SO DELICIOUS!!!! So glad you enjoy it! I could eat it every night. I made this with Monterey Jack cheese, because I don’t like strong cheese. I also added chicken, and it was really good!! Oooh…that sounds fantastic! I’ll be trying that combo next time. 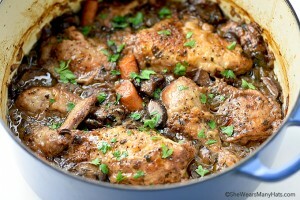 I wouldn’t say this recipe is meatless when you use chicken stock. 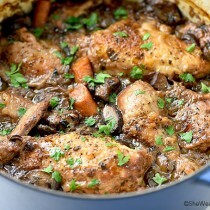 With That said, I will be making a vegetarian version of this recipe with vegetable stock because it looks delicious! I made this tonight. I sautéed shrimp with the mushrooms. Loved it, and the kids did too!! I will definitely make this again in the future! I give this 5 stars! So far the best pasta I’ve learned to make! My family loved it! I used Gouda Cheese instead and topped it with grilled chicken breast. Will make again next week!! So happy to hear you and your family enjoyed it, Gladys! How many people does this feed,l’d love to try it. This looks really good. I’m going to try this in the upcoming week with Parmesan chicken, garlic bread, and a side salad! I can’t wait!! Thank you for sharing. So happy to hear that you and your husband enjoyed it, Karla. It’s a favorite. And yay for lunch tomorrow! I made this the other night with rotini pasta, and it was SOOO good! I made the entire recipe for my husband and I, and we ended up eating just about all of it in one sitting! Great recipe, and nice and simple. Will definitely be making this again! I sub’d coconut milk, mushroom broth, raw goat cheese and gf pasta. It was yum, gf almost df and veg…happy tummy. Quick and easy to adapt. I love recipes that seem fancy but are super simple! Pinning! Oooh, I love the combo of spinach and mushrooms! And with a creamy chceese sauce??? Divine! 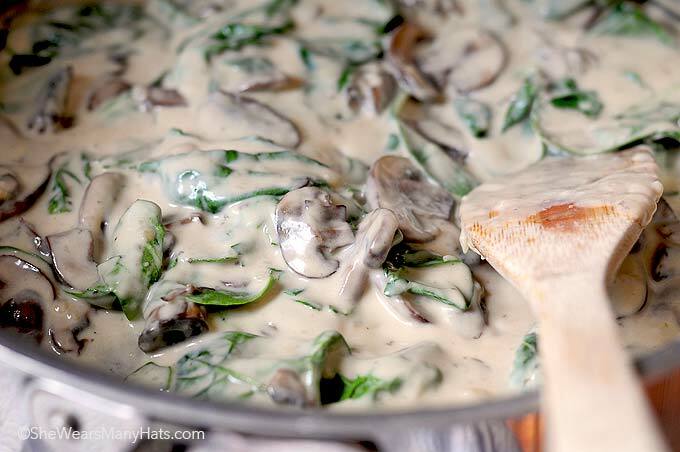 Creamy mushrooms over pasta are a favorite dish of ours, and then you made it all healthy with spinach! Love this! Will this work with 1% milk? It won’t thicken exactly the same but you can use it. This is such a pretty dish! I love that it’s simple to make but gorgeous enough for company! What a great pasta recipe, so perfect for our busy weeknights! I love this pasta dish! All of my favorites in one bowl! I made this tonight for Meatless Monday, and not only was it delicious, it was very quick! Thanks for sharing this great recipe. I look forwarding to trying more of your dishes! Gruyere or Gouda so I substituted Asiago. It was fantastic! I will be making this again for certain! Thanks! AMAZING!!!! I don’t usually comment but I just made this for my fam jam and I have to say this is a wonderfully easy delicious recipe. Not only did I have all the ingredients in my kitchen because they are so simple but it also took almost no effort. Easy and elegant? ? I think so. 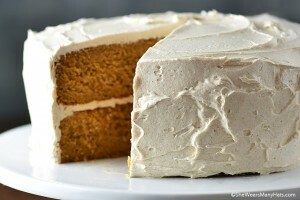 Can’t wait to make this for company. I did use half and half cream instead and only had old white cheddar on hand for the sauce but it turned out better than I thought possible haha. I also used fresh ravioli and it was just perfect. Oooh … I can’t wait to try it with ravioli! Hi there, i just tried this recepipe. It was YUMMI. But the sauce got quite a lot of lumps :-/ any ideas how i can fix that?? Just do a roux/bechamel instead – instead of whisking the flour into the milk & stock, whisk the flour into the olive oil once the mushrooms & garlic are cooked (you may need to add another TBSP or two of olive oil or butter). When it’s fully combined into a paste (roux), then whisk in the milk & stock a few TBSPs at a time. I have heavey cream can i sub that instead of flour and milk? And also i have mozzarella cheese on hand would it be ok? You can use those substitutions. Of course, the mozzarella will lend a different flavor from original. 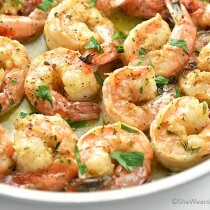 So gonna make this!Looks great.Gonna broil some Salmon to top with.Thanks! I am going to try this today, I’ve been hunting for a great recipe and this is it. Though I am going to replace Gouda with mozzarella . Thanks a lot…hope my husband likes it???????????? This . Was . Awesome!!!! Easy recipe and it tasted amazing!! This will be a new go-to! Thank you!!! I’m so happy to hear it, Allison! Looks fantastic! Curious why you opted to whisk the flour straight into the milk & stock rather than making a roux first with the olive oil to get rid of the floury taste & feel, and avoid clumping? I followed the directions and had absolutely no lumps and there was no floury taste. The mushroom florentine spinach recipe was easy and delicious. I would give it a 4.5 out of 5. My teenage son devoured it. Delicious! I used asiago cheese and egg noodles instead cause that was what I had and it was still so good. Added some roasted thyme carrots as well, so good. Going to be great for leftovers. Very creamy! Yum! Roasted thyme carrots sounds like a delicious addition, Sophia! We have just eaten your Mushroom Florentine Pasta Recipe and both my husband and I found really BLAND. I followed the recipe to the letter – but put a bit more spinach in it. Where did I go wrong? I’m not sure. We always adjust salt and pepper to taste when cooking. Maybe try that next time? I was reading through the comments because it definitely needed “something.” I wonder if thyme and/or basil would give it the umph it needs? I used Gouda and half and half instead of milk. Even added extra garlic and I could not taste it. Overall it’s a great base recipe I think. Made this over the weekend and loved it! I made small changes to my preference: a) doubled the spinach, and b) increased the flour:fluid by 1/3rd for more sauciness, c) made it vegan with vegetable broth (no chicken broth) and nutritional yeast (no cheese). Thank you for sharing your substitutions, Jessie! can I use parmesan cheese instead?? I would not recommend substituting the full amount with parmesan. It is not as creamy when melted. Can’t wait to try this and want to make it over the weekend. I have almost everything for this and we are going to the store to get the rest of what we need today. I’m getting close to lunch and I’m finding this is making me drool. I might add chicken too but I’m thinking maybe not. I don’t know what I will do but I know I will make it like it is and then decide if I want to add the chicken or not, which we have already. Thanks for a great recipe! I hope you enjoy it, Gail! I made this for all of my “men” last night and it was perfect! I didn’t change a thing in the recipe and it turned out as restaurant worthy! Next time, I will add chicken or shrimp, but you really don’t need to. Thank you for sharing! I am so happy you and your men enjoyed it, JanCam! Came out good. Added more spinach and more mushrooms would’ve been good. Peas went well with it and next time would make biscuits. Yum!! I had to use another 1/2 cup or so of milk as it was a bit gluggy but that’s easy to do! Next time I am going to throw in some sundried tomatoes. Thanks for sharing. Sundried tomatoes! A perfect addition, Liz. Can’t wait to try that next time. This was FABULOUS! Even my fussy 8 and 4 year olds ate it! (Well, they boo-hoo’d the mushrooms). I paired it with some Panko and Parmesan crusted chicken breasts. Oooh, I’ve got to try that addition, Katie. Glad y’all like it! This is fantastic! So quick and easy to put together too! I had some leftover New Year’s Eve brunch ham so I added some of that to the mix and it added a smokey/salty/ham taste that gave it a little kick! I will definitely be making this again as we love mushrooms and spinach. This would also be a great dish on a buffet line. Thank you for a great recipe! I’ve already shared it. Ham sounds like a lovely addition, Kitty. So glad you liked it! This was fantastic! Made the sauce early in the day and just added a little milk when reheating. Company loved it. I’m not sure either, but you can easily add more chicken broth or milk to thin out sauce as needed. If you like broccoli, I’m sure it would be nice. Frozen spinach can also be used it you allow it to thaw, then drain and squeeze it out well. Yum. Loved it, very easy. I remember making this exact recipe sooo many times when I was pregnant in 2016 and completely forgot about it…till now (also pregnant again) definitely need to save it this time. It was my favorite pasta recipe I’ve tried! Congratulations, Michelle! And glad to hear that you like it as much as we do. Tried this today – so easy and quick to do… Tasted so very yummy, too! I have a Chef at my house and we made it together last night. Was very good — we also added chicken. 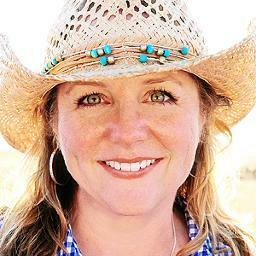 Pingback: Legendary Meat Lasagna Recipe | Easy Homemade Goodness! Just made this, super delicious. Did not have spinach, substituted with broccoli. Yummy.